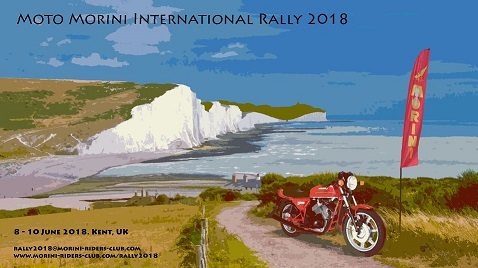 The Morini Riders Club will be hosting an International Rally in Kent from Friday 8 to Sunday 10 June 2018. We have booked exclusive use of a 4 acre venue which includes a magnificent Kentish barn that we can use for entertainment and dining. On the Saturday there will be a ride out in the Kent countryside with a lunch stop. On your return there will be a Morini themed festival in the courtyard complete with traditional cream teas. In the evening there will be a sit down dinner in the barn. All Moto Morini clubs and riders from around the world are invited, but anyone with an interest in Morinis is welcome, so please do tell your friends. As well as camping facilities, there is some bunk accommodation on site, and a great choice of hotels and B&Bs nearby. More details, including how to book and prices will be available later in the year, but in the meantime, put the date in your diary now! Great, it's in the same county as I am, so pretty much guaranteed to be within about 70 miles wherever it is, makes a pleasant change from the usual, and of course, handy for our continental neighbours. I look forward to it. I've visited the site, near Maidstone, and it should be a great event. And I love that white cliffs poster! Thanks for scheduling it for my next birthday - what a generous present - meeting and spending time with folk who enjoy and care for Morinis. I hope to join you. Firmly pencilled in. It might clash with a Curborough twisty sprint but will take precedence. Now we need to persuade the founder to turn up - will there be local real ale? Looking forward to this, at the moment it doesn't clash - will have to keep it that way. I'll be having some of that !! Meet you en route nicko !! The rally planning is going really well, more details about the event and how to book your place will be available in the next issue of ATG, on the website and here on the forum in early December! Good news everybody- Just in time for Christmas, it is now possible to book your place at the 2018 International Rally. Please see http://www.morini-riders-club.com/rally2018 for more information and to book online and pay securely with credit card. We also have a Facebook page for the event, go to https://www.facebook.com/MRCRally2018/ to 'like' it and share with your friends. It's payday weekend, don't forget to buy your rally tickets!